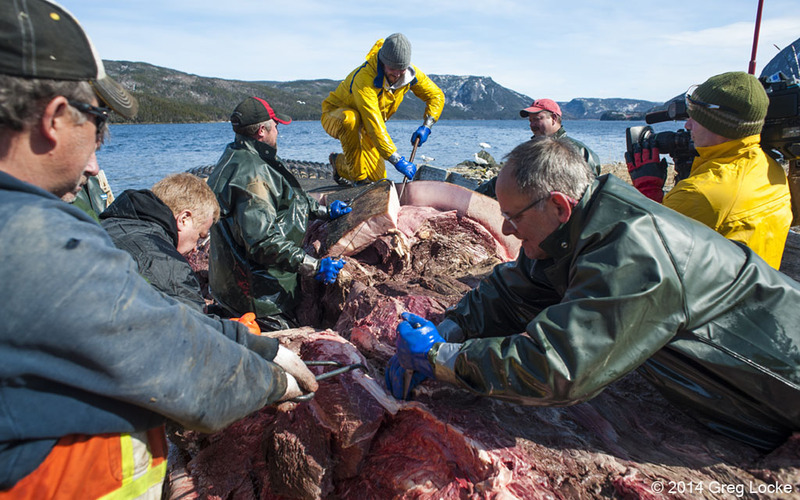 A team from the Royal Ontario Museum begin dissecting a blue whale on the beach at Woody Point, Newfoundland. Photo by Greg Locke © 2014 …click to enlarge. Anybody want a dead whale? After a rough winter in the waters around Newfoundland on Canada’s east coast a number of dead whales, including a number of endangered North Atlantic blue whales, washed up on the beaches of many small fishing villages. The question became how to dispose of a 100 tonne, 25 metre, rotting carcases that threatened the health of the people in the communities and dampened the pending tourist season. One town went as far as to offer it up on eBay. Its a story of something no one was going to touch …until someone wanted it. Then the stink began. Part 1, by Greg Locke, looks at the smelly dilemma on the beach of a Newfoundland village. Part 2, by Deborah Jones, examines the ramifications of the mystery deaths of the endangered North Atlantic Blue Whales. *Subscription or a $1 site day pass required to read A Whale For The Taking.